Cate`s Place: Peaches, A Tablecloth and Steps Forward! Peaches, A Tablecloth and Steps Forward! Beautiful day. 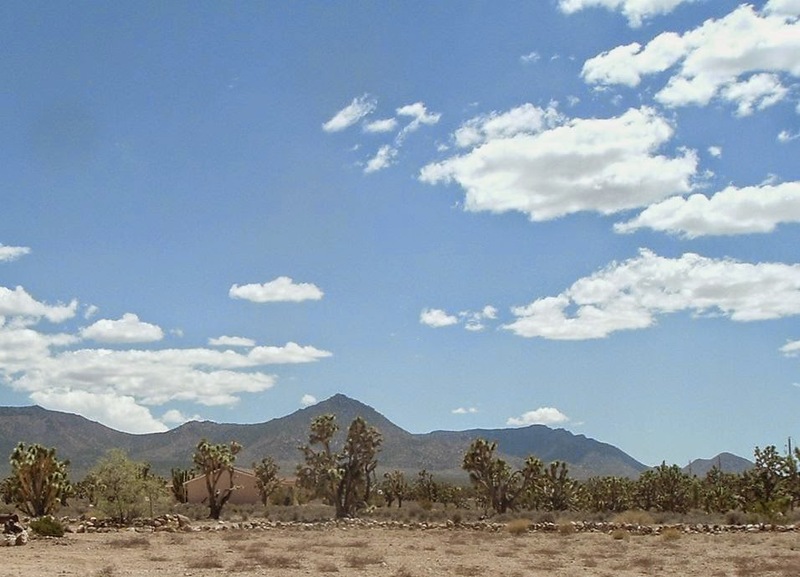 That`s Iron Mountain in the background. You`ll pass it if you visit the Grand Canyon Skywalk. I love the clouds. There`s a few homes up there and I hear it`s about ten degrees cooler in the summer. A sweet view from my front yard. 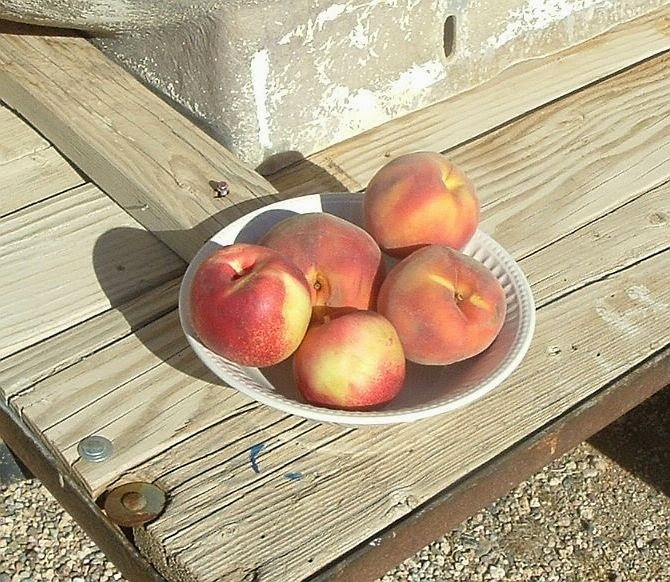 My neighbor brought me peaches and nectarines this morning. I didn`t know his late wife had fruit trees, let alone peaches and nectarines. They are ripe, juicy and cold. How did she do this in our drought stricken desert? 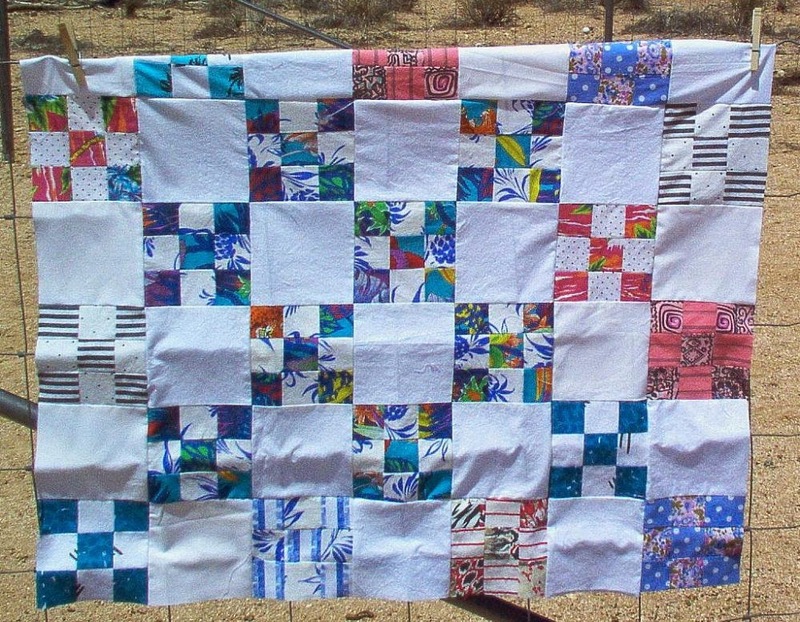 The fence was not the place to hang my little quilt top but there was a wind problem. I wanted a cloth to cover my kitchen table to catch flour and other dry ingredients when I am making bread. I usually have flour everywhere and I may drop a little sugar or salt. I am a prolific baker! Now when the bread, cake or pie is in the oven I just shake out the cloth. It will be backed with flannel scraps. So much easier than trying to dig the dust out my old table. I`ve had the nine patch blocks for years. I`m making time for friends again. The longer one separates from people, the harder it is to make that move back into your friendships. The "friends" who knocked on my door three days after my husband died, asking me what of his things I was selling (or giving away) are no longer friends. Shame on you. I am moving along, doing better every day. It was hard to accept help from friends. I`m getting better at that. God didn`t give me beautiful days just to throw them away. I resisted calling my future my "new" life. I didn`t want new. But it is my new life and I`m making the most of it. Thank you for visiting. I appreciate it. Can't wait to see your nine patch cloth on your table, what a great idea. Take care and enjoy your week. well you know something I never thought of that...a cloth when I am making bread....that season is right around the corner for us...I will have to make a gingham one of course...lol OHHHH what is your fav colour ..BLUE? I like blue. I wear lots of denim. Great with my lifestyle working in the yard. I like playing in dirt. yes I too am looking forward to a pix of you making bread on that cloth..nice to be able to move forward. I`ll bring my neighbor over to take the picture. That should be fun. Thanks. A pretty cloth you are making and for what methinks is an unusual purpose. Clever. You sound like you are becoming a bit more comfortable. I hope and pray. Hugs to you. The cloth makes my clean-up easier. Maybe I`m weird,lol. The farmer next door last year past away suddenly. His wife was left with the same situation. We told her take it easy, don't make any sudden decisions, but I have a feeling she finally got tire of their constant haranguing and so instead of giving stuff away she sold all of his stuff and did not budge on the price. There were some people with the audacity to come up at his funeral and offer to buy their farm, house and all so they could build a housing development. Thank you Deb. The peaches were great! Adjusting to single life takes time and lots of contemplation. You now have to figure out who you are without your constant companion. Yes, you do need to get out and be with people. Withdrawing is just one of the stages of grief. When you get past it you need to hang around with people you choose, and learn to say no to those you don't want to be with. Thank you for the wise, helpful advice. Being single after 42 years is an emotional challenge for me. Thank you so much for commenting. I appreciate it. Oh Cathy, I'm so very sorry to hear about your husband, praying you find peace and happiness in Williams, near family and new friends!! Keep in touch! Hugs! Hi Sue! It`s been rough but I`m doing better. My dog is a huge help. Lots of love and good company. OMG I can't believe people would be so crass...well maybe I would believe it - it is a changing world and not all the changes are good. People seem to have become very selfish in the last few generations. Love your cloth, that is a great idea - I might take it on! I also am a very messy cook, and it would be neat to just shake all the crumbs and stuff outside at the end of a baking session.